I'm always interested in books on health, nutrition, and body studies. I read everything from Dr. Huizenga's Where Did All the Fat Go? to Michael Pollan's The Omnivore's Dilemma and In Defense of Food to The Man Who Ate Everything by Jeffrey Steingarten. I stay away from fad diet books, and tend to go for exercise theory/diet theory books. I also love cookbooks, but try not to collect them. 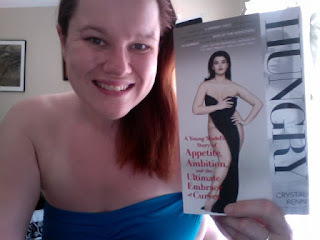 So anyways, I have heard lots of things about Hungry, by Crystal Renn. I wasn't so much interested in hearing about the modeling industry, but what it could do to a beautiful girl to make her anorexic and then to push her away from the anorexia. It's a very good read, with tons of great quotes. The biggest thing I got from the book is that some of my obsessions about my body might be completely from left field. I am jealous of girls whose thighs don't rub together. The bottom line is that I could be very thin and my thighs could still rub together, because I have such a high angle of inclusion between my hips and knees. Crystal Renn and I are the same height (5'9"). When she was awarded her first modeling contract, she weighed 95lbs. When I read that, there was just such a guttural reaction -- that I needed to change the focus of all this work from weight loss to health and fit gain. Deep down I know that I am slacking off when it comes to being an active and engaged person. I need to come to peace with the idea of never losing a pound, so long as I'm eating healthily and engaging in life. So I recommend reading this book. It isn't the most mind-riveting read out there, but it's a sincere and heartfelt memoir with the simple point of "love yourself as you are, not as what you want to be, or what others want you to be." The underlying promise of dieting -- a promise as powerful as any industrial strength foundation garment -- is that once we reach our goal weight, our lives will be perfect. That's the fairy-tale ending glimmering after the credits of a weight-loss reality show. It's the story written in invisible ink in the margins o the exercise stories in too many women's magazines. Eating well isn't about offering our bodies nourishing food--it's about getting skinnier. Exercise isn't about becoming strong, managing stress, or supporting heart health--it's about getting skinnier. Getting skinnier means that life will start playing in Technicolor to the accompaniment of a glorious orchestra. The problem is that real life doesn't work that way. Even if it were possible for everyone to be thin--and we've already proven that it isn't--thinness does not confer insta-happiness. It's hard for so many of us (including me, for years) to wrap our brains around the fact. We postpone living--taking beach vacations, buying the foxy dress that shows off our upper arms, asking out the cute guy--because we think that being daring is the province of the thin, and only after we've been "good" enough to get thin do we deserve life's prizes. Weight is the most of egregious example of "If I only achieve this one thing, my life will truly begin." I found your blog through fat to fit. This sounds like an interesting book, one that I need to read I have such a bad self image. I have to admit I have often thought, my life will begin when I lose weight. However, I have found I just wasn't living my life. I think the point is that no matter your size, no matter your shape, and no matter just about anything else, you can love who you are at this very moment. You don't need to wait for your body to match your mind to make that attitude shift. Think of it like this -- like it might be a grey day outside, but the sun is still shining and nothing can prevent that. Sometimes we're like that -- the things cloud our vision of ourselves, despite us being radiant all the time. You are that person right now and the bad self image is preventing from yourself and other people seeing it sometimes.